Are you ready for an adventure holiday that’s truly off the beaten track? Bhutan is one of the most visually stunning countries on earth, an unspoiled wilderness of craggy mountain peaks to the north and lush, green jungles to the south. This ‘Kingdom of the Clouds’ nestles between India and Tibet and offers travellers an enthralling blend of snow-covered peaks, friendly, humble people, dramatic landscapes and ancient Buddhist culture. Perched along the eastern Himalaya, Bhutan ticks all the boxes for those seeking a unique, once-in-a-lifetime adventure. Here, you can visit tiny mountain villages, sacred monasteries and isolated temple fortresses (Dzongs) perched high above the mountain passes. Hike through fields of rhododendrons as you explore the Paro Valley at the base of Chomolhari, Bhutan’s second highest peak. Shop for local handicrafts in the markets of Thimphu, Bhutan’s picturesque and visitor-friendly capital. 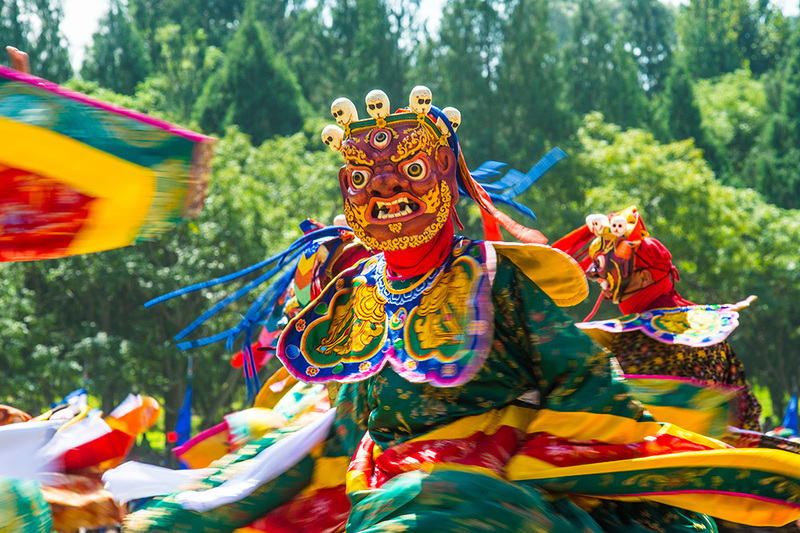 Time your visit to coincide with a traditional Bhutanese archery tournament or one of countless festivals that dot the calendar in the ‘Land of the Thunder Dragon’. If trekking is your main reason to visit Bhutan, you’ll find adventures to suit every budget and experience level – from the fairly easy Gogona Trek, which passes through one of the most beautiful lowland parts of the country, right through to the highly challenging Bhutan Snowman Trek, which traverses a remote part of the country and is considered one of the greatest treks in the Himalayan region. And if all that trekking wears you out, don’t worry. Bhutan travel offers plenty of other activities to keep you busy, from river rafting and mountain biking to guided wildlife tours in national parks. Over 70% of Bhutan is covered in forest and about half the country is made up of protected areas, providing sanctuary for wild creatures that include snow leopards, red pandas, elephants, golden langur monkeys, one-horned rhinos and more. The Bhutanese have a deep reverence for the natural world, and it shows in their commitment to conservation. Make sure you try your hand at Bhutan’s national sport – archery (known locally as ‘the Dha’). Most towns have an archery field, and visitors are encouraged to jump in and have a go. Unless you’re from the Maldives, India or Bangladesh, you’ll need a visa to visit Bhutan, and the only way to get one is through a tour company. Fortunately, this is a simple process – you send a photocopy of your passport photo page to the tour company, who organises your visa. They later email you a visa clearance letter, which you show at point of entry. An immigration officer will then stamp your passport with an official visa in Bhutan, and you’re good to go. In Bhutan, you’re free to wander around individual cities all you like and can hike nearby trails on your own with no problems. Where you’re restricted is in travelling independently between cities; this is only allowed with a tour guide. Regional checkpoints regularly check tourism company documents and verify tourist visas so there’s no way around this, but it’s not as inconvenient as it sounds. Having a tour company take care of all the logistics for you has its advantages – you’ll worry less about trivial details and can just concentrate on enjoying your trip. Your tour guide normally meets you upon arrival. Visa costs can be up to $250 USD per day, but keep in mind that this fee includes accommodation in a 3-star hotel (you can upgrade to a 4 or 5-star where available and pay extra), private transport (usually a jeep), your driver, guide, meals, drinking water, tea and all entrance fees to parks, monasteries, temples, etc. Part of your visa fee goes toward helping fund the country’s education and health system, too. In Bhutan, think of your visa fee and tour costs as virtually one and the same. CONSIDERING A BHUTAN TREKKING TRIP? 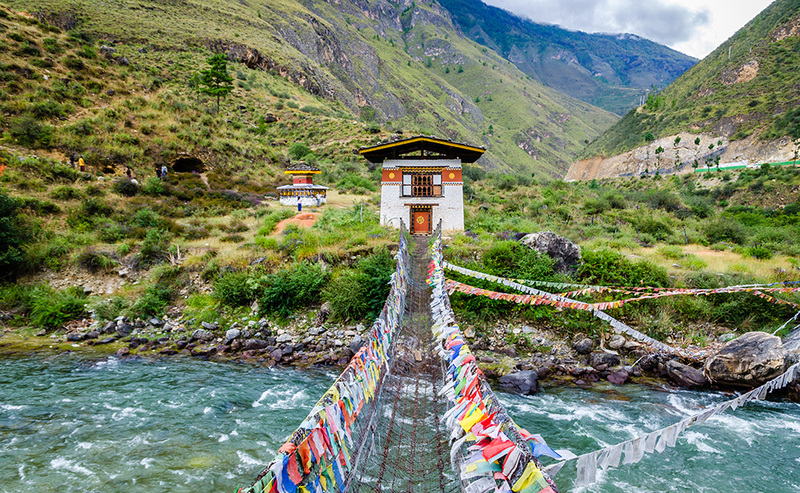 Bhutan has one international airport – or you can enter the country overland. Bhutan Airlines, Druk Air and Buddha Air (Buddha is charter only) fly into Bhutan via India, Bangladesh, Thailand or Nepal. Indonesia and Malaysia also offer flights in certain seasons. The main airport is in Paro, a city about an hour’s drive away from the Bhutan capital of Thimphu. Shop around for flights – you may find it’s cheaper to book a separate return trip to Bangkok and another return trip from there to Bhutan, rather than purchasing a whole-trip fare. Sometimes flight costs are included in your tour cost but not always. You could also enter Bhutan overland from India. Because your tour takes care of most major expenses already, you won’t need to carry around much extra cash in Bhutan; some travellers have found $100 per week more than enough for their needs. You won’t find many ATMs here – especially outside the bigger cities – so you might want to grab some money from the machine at the airport upon arrival. The local currency in Bhutan is the Ngultrum (often shortened to Nu). Typically, you’ll pay for most things in either Nu or US Dollars and receive change in Indian rupees. Rupees are widely accepted throughout the country and are currently paired one-to-one with the Nu. Visit a travel doctor before visiting Bhutan to sort out any required vaccinations, obtain necessary medications and get up-to-date advice on basic health matters for your personal itinerary. Talk to your doctor about ways to combat altitude sickness too, which can affect travellers venturing above 2400 metres (around 8000 feet). Medication that helps you deal with ‘accelerated digestion’ isn’t a bad idea either, whether you end up needing to use it or not. Be aware that the Bhutanese love their spicy food – even at breakfast! It’s easy to get a local SIM card for your phone in Bhutan, but don’t get your hopes up too high about the quality of Internet connections, which can be a bit hit-and-miss throughout the country. Spring and autumn are popular times for Bhutan trekking, with many visitors arriving during March-April and September-November. Although summer is the rainy season, you don’t get the heavy monsoon deluges here that are common in South-east Asia – usually rain is light and doesn’t impact the tours. Winter offers the clearest views of Bhutan’s impressive peaks, though some roads may be closed due to heavy snowfall. Take appropriate clothing for the activities you’ll be experiencing, and be aware that you won’t be allowed into monasteries or Dzongs if you’re not properly dressed (long trousers, long-sleeved shirts and closed shoes). Don’t underestimate how cold it gets in the mountains in Bhutan, even in summer. Thermal merino underwear, good layering options and a hooded raincoat are essential items here. In Bhutan, walking below 6000 metres is considered ‘trekking’. Going above that level is deemed ‘mountaineering’ and is forbidden, as the Bhutanese believe the higher elevations are the realm of gods and goddesses and should not be traversed by mere mortals. 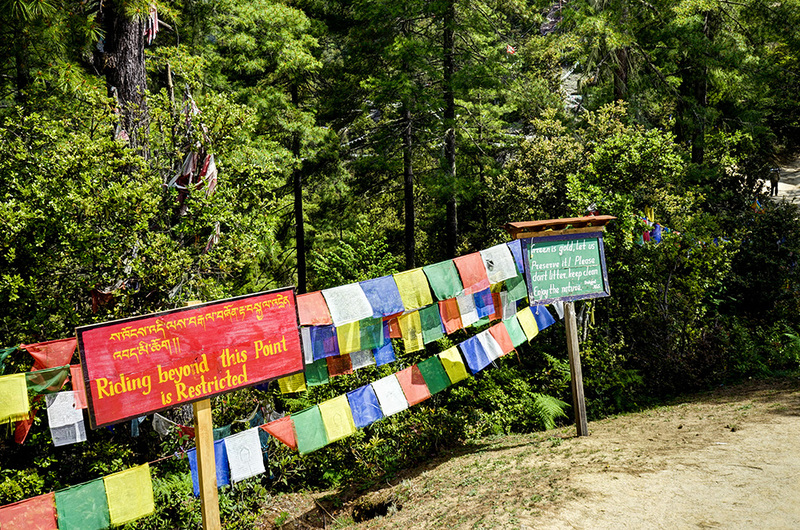 If you’re planning some serious multi-day Bhutan trekking and your current fitness levels aren’t up to scratch, get some training in well before departure – the sooner you start the better. Training should include strength and endurance activities as well as cardio. Don’t forget your prescription medications and always pack a small medical kit that includes bandages, aspirin, burn cream, motion sickness tablets, sunscreen, lip balm, insect repellent, water purification tablets (MP1 chlorine dioxide tablets work well) and other basics. Disinfectant hand gel comes in handy when clean water for hand washing isn’t available. Bring minimalist toiletries and pack some high energy snacks to keep energy up. One of the most important items to have with you is an e-reader (such as a Kindle), so you’ll have something to read in camp. The battery should last you more than two weeks before a recharge is necessary. These lists are just the starting point, of course – your itinerary and activities will dictate your exact needs. Two of the most popular tourist attractions in Bhutan are the Paro Dzong and the Phunaka Dzong. Not far from the Paro Dzong is the start of the trek to the world-famous Tiger’s Nest, a sacred Buddhist temple site wedged into the side of a granite cliff in the upper Paro Valley. 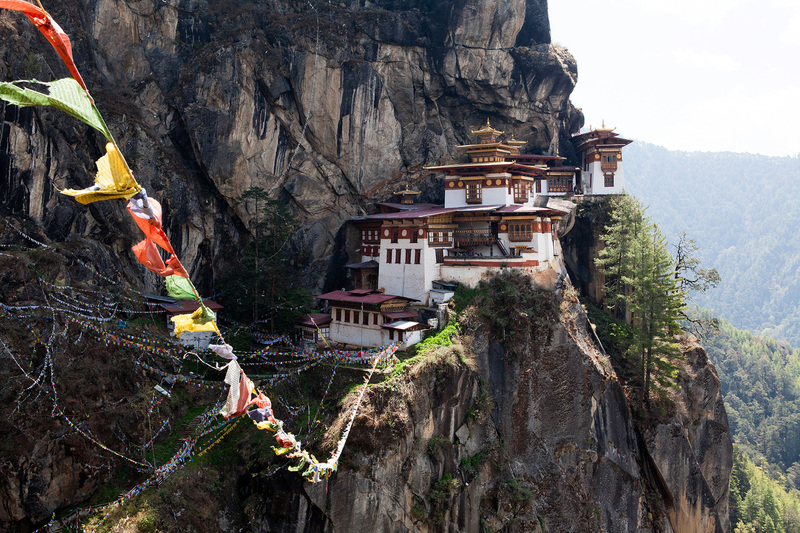 If there’s a ‘must-do’ in Bhutan, a trek to the Tiger’s Nest is probably it. Factor in 2-3 hours to get up to the temple and 1-2 hours getting back, depending on your fitness level. Whatever pace you set, you’ll definitely be glad you made the effort once you see this amazing sight – there’s simply no other place on earth quite like it. This 4-day trek takes you from Paro to Thimphu, traversing a wonderland of clear lakes, mountain ridges, dwarf rhododendrons and blue pine forests, with numerous Dzongs, monasteries and quaint villages to visit along the way. This one is for the fit and experienced only – it’s considered the most difficult trek in Bhutan, venturing into the super-remote Lunana district. It crosses three mountain passes above 6000 metres and takes 25 days. March-May or September-November are the best times to tackle this epic adventure – if you’re up for it! This moderately challenging trek is the perfect ‘all-rounder’, featuring some of Bhutan’s most photogenic scenery and a ton of visual variety. Your camera will be working overtime to capture all the fish-filled lakes, exotic plants and animals and never-ending panorama of stark peaks in the background of every shot (you might even spot Mount Everest in the distance). This trek takes in the Chamgang and Genekha villages, winding through wildflower-studded meadows, through yak herder camps and deep into serene pine forests. Whatever trek you get up to in this spectacular country, one thing is certain – you will never forget the astounding natural beauty of Bhutan! When I was in Nepal, I remember seeing advertising from the local tourist places about Bhutan. Unfortunately at the time I didn’t know much about it, if I knew then what I know now about it, I would have taken advantage of my time there. One of the greenest states in the world. 70% of its land is covered by forest and you’ll get plenty opportunities to hike and climb and trek across twisty trails that cut through the heart of this country, using nothing.